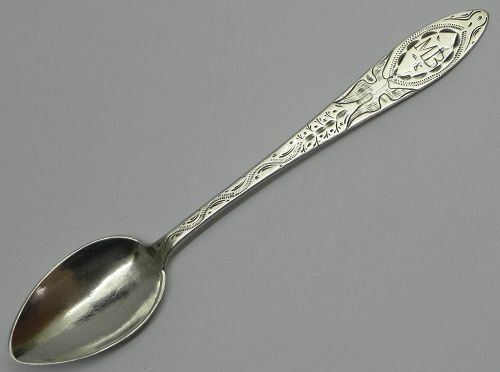 For your consideration is an interesting late 18th Century style American coin silver spoon, marked "W (pellet) D". It is my assumption at least that this piece, which measures about 4 15/16 inches in length and weighs about 8 grams, is American. It does not feel Canadian or British Colonial to me, nor does it come across as Continental. The light weight, unusual shell-back decoration, small bowl size, mark and engraving to the handle indicate to me that it is probably American and quite possibly from New England. Please take a look at all five photos. Perhaps I've missed a trick, but I haven't solved this one, so I need some help! If you can provide a solid attribution for this piece, I will send you a lovely coin silver spoon (probably from Philadelphia), in excellent condition, as a prize. Thanks!